The Last Ten Nights of Ramadan - Don't Miss Them! The last ten nights of Ramadan are very special. The first of these nights occurs on the eve of the 21st day of Ramadan. In other words, it is the night that commences after the completion of the 20th day of fasting. Sometimes there are only nine nights, whenever the month of Ramadan lasts for only 29 days. Nevertheless, they are still traditionally referred to as "the last ten nights". The last ten nights of Ramadan are very special. These are the nights that the Prophet (peace be upon him) would spend in constant worship. Among these nights is Laylah al-Qadr – a night more blessed than a thousand months. The Prophet (peace be upon him) used to single these nights out for worship and the performance of good deeds. He would exert himself in worship during these ten nights more than any other nights of the year. When we say that the Prophet (peace be upon him) spent the whole night in worship, we should qualify it. This is because he would spend some time eating dinner, partaking of his pre-dawn meal, and other similar activities. However, he would spend most of the night in worship. `Â'ishah informs us that the Prophet (peace be upon him) used to wake up his family during the last ten nights of Ramadan. Indeed, he used to wake up his wives for prayer throughout the year, but that was so that they could pray for a small fraction of the night. 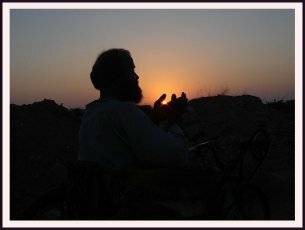 During the last ten nights of Ramadan, the Prophet (peace be upon him) would wake up his wives to pray for a much longer portion of the night than during the rest of the year. When `Â'ishah tells us that the Prophet (peace be upon him) would "tighten his waistbelt", she is speaking figuratively. The phrase means to set about to devote oneself fully and wholeheartedly to the task at hand. One of the greatest distinctions of these ten special nights is that one of them is Laylah al-Qadr – the Night of Decree. This is the greatest night of the year – better than a thousand months. This means that a Muslim can earn more rewards on Laylah al-Qadr than he would if – excluding this special night – he were worship his Lord for eighty-four years straight. This is one of the immense favors that Allah has bestowed upon the Muslim community. Ibrâhîm al-Nakha`î says: "Good works performed on this night are better than those performed consistently for a thousand months." Belief in Allah, in this hadîth, means not only to believe in Allah, but to believe in the reward that we are promised for observing prayer on this night. A Muslim should seek out this special night by spending the last ten nights of Ramadan engaged in various acts of worship. These include reciting the remembrances of Allah, reading the Qur'ân, and begging Allah's forgiveness. It is best for us to strive hard on all ten nights, because the Prophet (peace be upon him) said: The way we "look for" Laylah al-Qadr is by engaging in extra worship. When the Prophet (peace be upon him) said: "Look for it in the last ten nights" he did not mean that we should literally "look for" signs and indications that distinguish Laylah al-Qadr from other nights. The things that distinguish Laylah al-Qadr from other nights are part of the Unseen. These are the ways in which Laylah al-Qadr is special. They are not things that we can see with our eyes. No one after the Prophet (peace be upon him) can see the angels. The practice of i`tikâf is a strongly recommended act. It is defined as remaining in retreat in the mosque for the express purpose of worship. The purpose of doing so is to devote one's heart exclusively to Allah. The person engaging in i`tikâf keeps this intention close to mind and seeks Allah's blessings. He should not forget the reason why he is observing this retreat. A person observing i`tikâf does not leave the mosque except for what is absolutely necessary (like going to the bathroom). While in the mosque, he should busy himself with the remembrance of Allah. He should make sure to offer the remembrances of the morning and evening and the prescribed remembrances for the five daily prayers. He should perform all of the Sunnah prayers and all other recommended prayers, like the Duhâ prayer. He should read as much of the Qur'ân as he can. He should spend less time eating and sleep as little as possible. He should avoid unnecessary talk. However, he should engage in advising his fellow Muslims and in enjoining them to truth and to patience. Generosity and open-handedness are strongly encouraged in Ramadan, especially during the last ten nights. By doing so, we emulate the example of Allah's Messenger (peace be upon him) as well as of our Pious Predecessors. Also, this month is noble, and good works carried out in this month are more blessed than they are at any other time. Also, during this month, people are preoccupied with fasting and worship, and this distracts them from their livelihood, so they might need some assistance during this time.